While sitting around the Thanksgiving table at my brother’s house this year, I thought about this blog post from 2010. 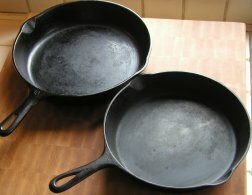 Seeing these two pans on the counter, well seasoned and ready for action, was like greeting an old family member. “Cast Iron” is one of my favorite stories, hope you enjoy it. Hope you had a warm Thanksgiving and Happy Hanukkah! 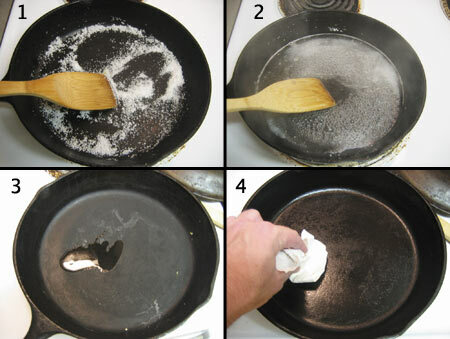 Because it was my Aunt J’s kitchen the skillets were seasoned per her method: an olive oil rub with a paper towel. For the past three weeks I’ve used his skillets to make many different dishes: scrambled eggs, beef stir fry, and caramelizing garlic and onions for spaghetti. “Man I love this skillet!” I thought to myself. However, I never purchased my own skillet. While wondering WHY I never purchased one, and how awesome these pans are, it hit me- people are seasoned skillets. You can’t deny the fact that life does season us up. Life experiences, good and bad, have seasoned my mind and spirit. So when the trials of life come I’m able to saute them up, processing them properly: the bad “stuck-ons” no longer “sticking” to my consciousness, following me around like a constant reminder of failure or shortcomings, and the good left over “flavor” of life sinks into the pores of my very being. How each of my relative’s have a custom way of seasoning their cookware, so do we season our hearts and minds. No matter what process we use, preventing RUST is the main purpose of our efforts. Rust, given sufficient time, oxygen and water, will convert any iron mass and disintegrate it. The toughest of metals, iron and steel, can get corroded. Rust in our heart can make us cold and callus. Love the metaphor, Shannon. You've written a fine and lasting piece here. Gonna share it on FB right now.